What is meant by 100-per-cent. Brake Efficiency? Perhaps the principal law covering any change of speed of a vehicle in horizontal motion is that a force equal to its own weight will, when acting on it, increase or decrease its speed by 22 m.p.h. for every second the force is in action. Similarly, a force equal to half the vehicle's weight will change its speed by 11 m.p.h. during each second it is in action, and so on for and other proportion the force may bear to the vehicle's weight. All tables giving stopping-distances at different speeds and brake performances are based on this fact, and the acceptance by the motor trade and users generally that a coefficient of friction between tyres and road of unity with its corresponding maximum brake force represents 100 per cent braking. It will be seen from any braking chart that, for a given braking performance, shopping-distance increases as the square of the speed, i.e. if the speed is doubled the stopping distance is four times as great, and this again depends upon the facts already stated. If a vehicle travelling at 30 m.p.h. (44 feet per second) is braked by a force equal to its own weight, it will lose 22 m.p.h. per second and will therefore take approximately 1.36 secs. to lose 30 m.p.h. and come to rest. Providing the brake force is constant, its average speed during braking will be half its initial speed, or 22 ft. per second, and as this average speed is maintained for 1.36 secs, the stopping-distance will be 30 ft. For the same brake performance, however, from 60 m.p.h. the time taken in losing all speed will be twice as long, or 2.72 secs., but in addition the average speed during the stopping-time will be twice as great, or 44 ft. per second, thus giving a stopping-distance of 120 ft., or four times that from 30 m.p.h. Brake testing on the road from any speed is usually carried out with the aid of an inertia instrument, and these can be generally classified into two types, both depending on inertia effects during speed change, but in one case the inertia of a mass mounted as a pendulum is used, while the other depends on the similar inertia of a column of liquid in a closed circuit of glass tubing. In both cases, application of the vehicle's brakes disturbs the attitude of repose of the pendulum or the column of liquid as in each case the free mass adopts a new position which depends directly on the rate at which speed changes. A freely suspended pendulum in a vehicle which is either stationary or moving at constant speed will, of course, retain its normal vertical position, but during any change of' speed the pendulum deflects from the vertical and, providing the speed changes at constant rate, the rate of deceleration or, for the matter of that, acceleration, is always correctly represented by the tangent of the angle to which the pendulum is deflected from the vertical. 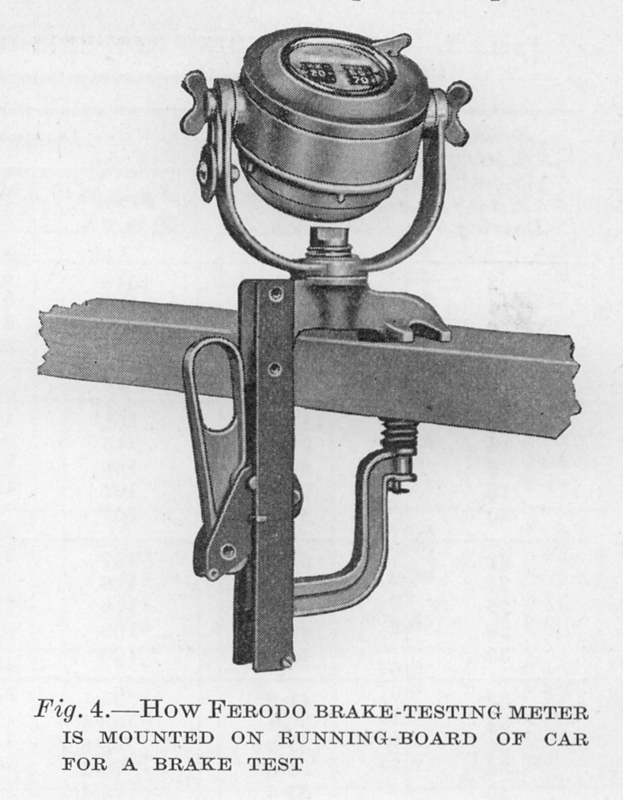 Perhaps the best-known instrument of this type is the Ferodo brake-testing meter (Figs. 2 and 3), which consists of a powerful permanent magnet suspended at one end on anti-friction bearings in a non-magnetic casing which is almost completely filled with a light damping liquid. The bottom end of this pendulum swings just clear of a thin brass diaphragm, and outside this diaphragm a light armature is suspended from co-axial pivots so that the armature follows every movement of the pendulum pole inside the casing. 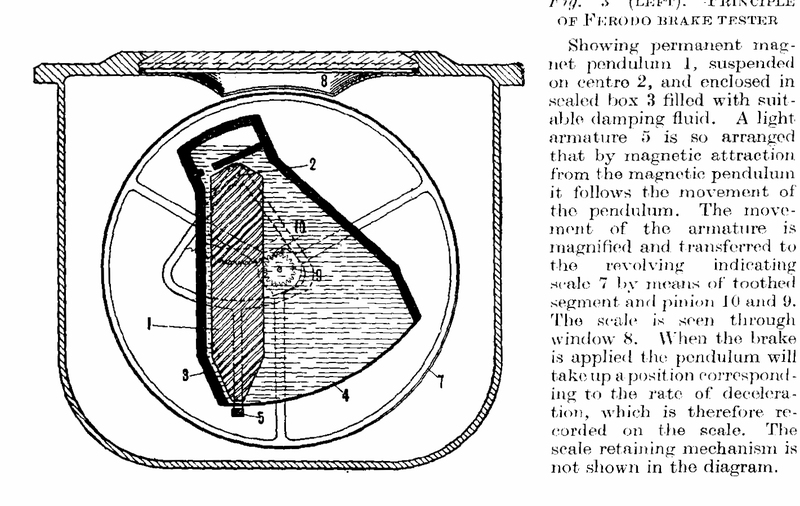 The armature is connected through instrument gearing to a cylindrical dial encircling the mechanism, and the calibration on the dial can be seen through a small window in the top of the instrument outer casing. The dial itself gives two separate readings, the left-hand one reading the equivalent stopping distance at any particular rate of retardation from 20 m.p.h., and the right-hand scale giving the corresponding reading of brake performance or "efficiency". The meaning of this brake-performance figure expressed as a percentage has been explained earlier in this article. The instrument has a universal mounting terminating in a quick-acting clamp, and all that is needed is to clamp it to some rigid portion of the vehicle and, with the vehicle standing on level ground and the instrument controlling lever in the free position, set the instrument so that the marks at the side of the window coincide with zero, or set level marking on the rotating dial. The instrument is clamped in this position, and no connection is required with any part of the vehicle's mechanism. In order to obtain a test reading, the instrument control is turned to "test", the vehicle driven up to any speed above 15 m.p.h. and the brakes applied. There is no need to observe the reading, as the scale is automatically held at the maximum obtained. The reading will therefore be noted after each individual brake application, and by turning the control to "free” and then back to "test", the dial is returned to zero and the instrument is ready to record another brake application. Generally speaking, brake testing is carried out on approximately level roads, but this type of inertia instrument can be equally satisfactorily used on a gradient, the instrument still recording correctly under such conditions.